As of December 7, 2015, Be Ryong Martial Arts will be locate at 218 W. Glebe Road, Alexandria, VA. The new studio is in the same building, but it’s on the second floor and the entrance is from the parking lot. If you are facing the old studio, the new studio is to your right and around the corner to your left. There is only one entrance on that side of the building. Go through the door and up the stairs. The new studio is larger and has beautiful windows that let in a lot of natural light. Over the past few weeks, Master Yun and some of the students have been hard at work getting the new studio ready. Check out our Facebook page to see before and after photos of the studio. Classes will resume as normal, same schedule, at the new studio. We look forward to seeing everyone at the new Be Ryong! Filipino Martial Arts Comes to Be Ryong! You already know that Be Ryong teaches Tae Kwon Do and Hap Ki Do. But did you know that you can also learn Filipino Stick Fighting at Be Ryong? 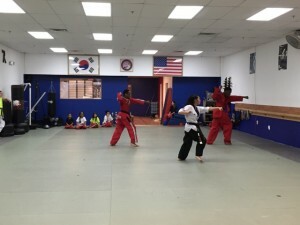 Jess del Mundo, one of the instructors who is a 2nd degree black belt in Tae Kwon Do and 1st degree black belt in Hap Ki Do, has been offering classes in Filipino Stick Fighting, also called Eskrima. Jess has been teaching Eskrima once or twice a month, usually on Sundays at 2pm. Check out the Schedule to find out when the next class will be held. Classes are free and open to teens and adults who are already Be Ryong students. Questions? Come by the studio and look for Jess; he usually teaches the Friday, 6pm all belt TKD class. Master Yun has tentatively scheduled the dates for the next TaeKwonDo black belt test to be Saturday, December 19, 11am. The HapKiDo black belt test will be held sometime in January. It’s too early to know which candidates will be allowed to take the black belt test as the students have been taking bow black classes with Master Yung to refine their kicks and forms. The bow black belt is the belt below the first degree black belt. Black belt tests are only held every six months, June and December. The black belt test at BeRyong is a grueling test of skill and endurance. 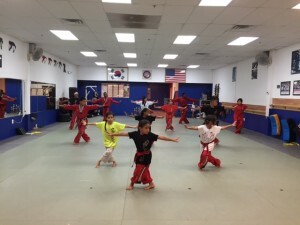 Students must perform all of their kicks and forms; spar; break lots of boards; do hundreds of push-ups, site-ups and squats, and whatever else Master Yun has in store for them. Black belt tests only vaguely resemble regular belt tests and they are 3-5 hours long, depending on how long it takes the students to finish all the requirements. In the next few weeks, we’ll post tips for preparing for a black belt test. Good luck to all the bow blacks preparing to take the black belt test in December! The Be Ryong did a wonderful job during the Open House on Saturday, September 26. This is part one of the demonstration. The students did forms and breaking. This is part two of the demonstration. This video includes breaking by some of the most experienced black belts, including a break while doing a black flip from atop Master Yun’s shoulders by Hanna. 5:00pm-5:45pm – Trial Lesson. Open to all. No pre-registration required. Just come in comfortable clothes and arrive by 4:50pm. I’ve you’ve ever wondered about martial arts, if you’d like to give it a try, or if you just want something fun to do for the entire family, come on down and take a free class! Plan to bring a friend or two or three! Find out more about the BeRyong Open House on September 25 and 26. It’s that time again! BeRyong will hold its annual Open House on Saturday, September 26. During the Open House, we’ll have free classes for kids, teens and adults and demonstrations by the BeRyong TaeKwonDo and HapKiDo demo teams. 10:30am – 11:00am – Trial Lesson. Open to all. No pre-registration required. Just come in comfortable clothes and arrive by 10:20am. 11:00am – Student Performance. Students all ages from the studio will demonstrate kicks, forms and breaking. 11:30am – Demo Team Performance. 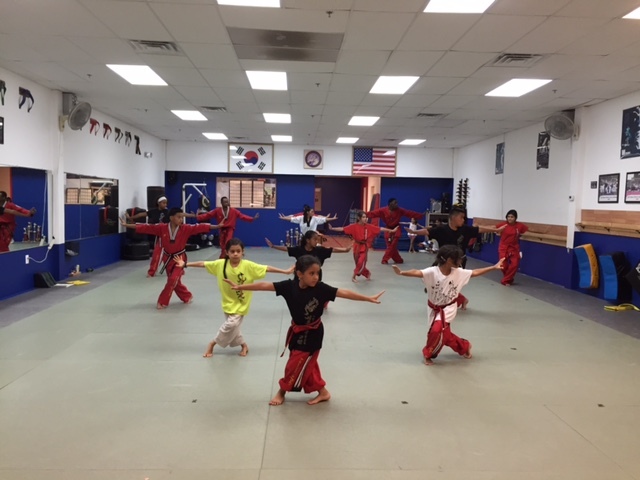 The demo team is the elite team at Be Ryong that develops and performs special routines and breaking combinations. You’ll see daring jumps, kicks and breaks; an awesome self-defense demonstration; and crisp forms. Please Save the Date and plan to bring a friend or two or three! The Open House is free to all! Welcome to the Redesigned Be Ryong Website! Let you know about school schedule changes, specials and more! Be sure to subscribe to receive updates via email or RSS so you don’t miss any BeRyong news!